When I first began solving a few Mystery Mondays I kept a blog of that experience, usually with a discussion of how I went about solving them. I kind of stopped doing that after the first three. Here they are for posterity. I finally figured one out! I decided this looked like a migrant farm worker camp — a fairly fancy one with several outhouses (possibly even with showers). This camp is adjacent to what looks to me to be an orange grove. Given the shadows, it appears as though the road is probably oriented NW-SE, while the rows of trees appear to be N-S. There is a railroad along the SW side of the paved road. Going on the orange grove assumption, this "narrowed" it down to California and Florida. The scarcity of trees outside the grove, and the slightest hint of an irrigation canal along the northern edge of the camp and orange grove, made me lean toward California. Also, the NW-SE orientation of the road and railroad juxtaposed with a regular N-S,E-W grid (evident in the field and orange grove) is very common in the San Joaquin Valley (the primary region for citrus crops in California). So, I scoured Google Earth for quite a while looking for this location. After a couple of hours, I remembered that in one of their previous posts for a Mystery Monday which was never solved, Vintage Aerial provided a KMZ file of all the flight paths for rolls of film they've digitized so far (here). When you load this KMZ into Google Earth, you can click on a flight path and in the info box that pops up is a link to a web page showing the photographs on that roll. I narrowed my search to the areas where flight paths were shown in the San Joaquin Valley, looking specifically for flight paths near NW-SE oriented roads with an adjacent railroad. Within minutes I discovered that the photo in question was Frame 22 on Roll 1CME in northern Merced County. It did not take long to find the unique arrowhead shape of the (former) migrant farm worker camp along Sante Fe Avenue (County Rd 37), a few miles northwest of Ballico, CA. This was a tough one and I spent a lot of time browsing through the photo archives at Vintage Aerial. My son had given me a general hint of the time frame based on the model years of the cars at the Volkswagen dealership; so, on Tuesday, when Lance (who posts these Mystery Monday blogs) narrowed it to a state, I started going through the photo archives for Iowa in the late 1960s. Iowa and Ohio seem to be the states that Vintage Aerial has concentrated on; so there were LOTS of rolls of photos to pour through. I did a Google search for Volkswagen dealerships in Iowa, and started my stroll through the Vintage Aerial archives with the counties containing those that claimed to have been around in the 1960s. Finding nothing in those counties, I began a systematic search through all the counties with photos taken in the 1960s. It took the final clue from Lance before I could find the image, and then try to narrow down it's location based on the flight path and the images before and after it in the roll. On Friday, Lance provided the hint that the photo was taken in Buena Vista county. I was surprised that the earliest year of photos scanned was 1971, as I knew (from my son) that the model of VW bus in the photo was 1968 or earlier. It turns out I failed to take into account that this dealership apparently did not keep much (if any) new stock on hand (perhaps no more than what is in the showroom, which cannot be seen in this photograph); so I had been looking a little earlier in time than I should. I soon found the roll containing the photo; and then used the indicated flight path to guide my search in Google Earth. This is photo 40-IBV-20, taken in 1971 (link to photo). The locator on your web page for this photo is off (about 3 miles east of where it should be), the actual location is on E Lakeshore Drive in Storm Lake, IA, in the block east of Memorial Road. 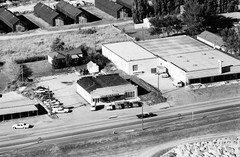 The Volkswagen building is now vacant, but the building next door, the Furniture / Floor Covering store which you provided a close-up of, is now Lakeshore Cyclery & Fitness (http://www.lakeshorecyclery.com/) … I discovered this using Google Street View. They have since fixed the locator on the web page for the photo. This time I not only got bragging rights, but they offered me a free 8"x12" print of the photo of my choice! Naturally, I chose the photo of Rucker. This time their KML file failed me. This looks like a school, small college, or possibly even an orphanage or boys home (is there a difference?). 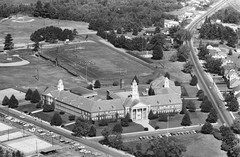 I could tell from the automobiles in the photograph that this had to be the early 1960s, as there were several cars in the parking lot from the 1950s (students and teachers usually do not have the latest model cars). It looked "East Coast" to me, but I quickly went through the photo archives for the counties in Pennsylvania and New Jersey of photos taken in or before 1965 whose flight paths were included in the KML file. So, I started working my way westward. I found a building in Perry County, Ohio, that looked quite similar architecturally, so I was encouraged to keep looking. But, after several hours, I had turned up nothing. Lance saved me on Wednesday with a clue: this photo was taken in New Hampshire! There are no flight paths in the KML file for ANY year (1960s-2000s) in New Hampshire! So I went to the Discover Your Photos page and, one-by-one, selected each county in New Hampshire to see what years were available in each. Only Strafford County had photos in the early 1960s (1963 & 1964), so I started looking around in Strafford County using Google Earth. A few minutes later I was in Rochester, NH and FOUND IT! Spaulding High School. According to one old postcard: "This building was given the city through the generosity of the Spaulding family. It is said to be the finest and most up-to-date of any east of the Mississippi." I've found it, but since I've recently won one of these, I'll let someone else have a chance. This building is still standing and used for the same purpose as when this photo was taken (although there have been additions off the ends of both wings). It can easily be found using Google Earth, especially if you look at the automobiles and then use the "Discover Your Photos" page here to narrow it down to a county. According to postcard 1: "This building was given the city through the generosity of the Spaulding family. It is said to be the finest and most up-to-date of any east of the Mississippi." I must confess that I do apprehend some danger. I fear that they may place too implicit a confidence in their public servants, and fail properly to scrutinize their conduct; that in this way they may be made the dupes of designing men, and become the instruments of their own undoing.